The layout was planned in the winter season. 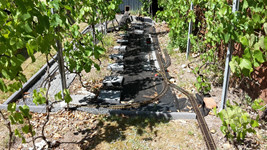 Materials, actual track in the garden, and design indoor/outdoor operation was performed. The small indoor back-up sections was made in the winter time. The outdoor part was started in the early spring time and was planned to be done in 4-5 weekends. Using the GOT-system it was a reasonable simple task with limited cable work and easy drive using DCC by radio and battery support in the trainsets. In this way we could use all our old track material without being worried about the loss of power in the trains. We made it so, that trains could shift to track-power when the trains were cleaned by the LGB track-shoes.